Nowadays, cosmetic dentistry encompasses more that just fixing your teeth. Modern cosmetic dentistry seeks to enhance your smile in a multitude of ways. One such way is through Botox & Juvederm treatments. Although usually associated with the world of plastics, Botox & Juvederm can be safely administered by a trained dentist to help firm up and improve the soft tissues of your face to enhance your overall smile. Botox, or botulinum toxin, is an FDA-approved prescription product that works by preventing contraction in the muscles, which causes wrinkles to relax and soften. It is a non-surgical procedure that requires no downtime or recovery. In dentistry, Botox is especially useful for treating high lip lines, assisting patients with new dentures, retraining facial muscles for orthodontic treatment, and for the treatment of TMJ or chronic facial pain. Juvederm is a Hyaluronic Acid that is injected into static wrinkles, deep folds, and lips in order to reduce wrinkles, soften folds, and give the lips a more plump appearance. Often times, Juvederm is injected into the smile lines (nasolabial folds), marionette lines (angles of the mouth), lips, vermillion border of the lips, and philtrum lines to increase volume in these areas. Hyaluronic Acid is a naturally-occurring sugar in the body that holds water at the injection site, acting as a cushion. When we age, our skin loses elasticity like a balloon loses air. Dermal fillers essentially pump your skin back up the way air pumps up a deflated balloon. In this way, dermal fillers like Juvederm can instantly remove years off the face. Dentists are actually the ideal medical professional for injecting Botox or Juvederm. Because they have an advanced knowledge of all the facial soft tissues, nerves, blood vessels, and muscles, they can pick the perfect spot to inject Botox or Juvederm safely and effectively. Am I candidate for Botox or Juvederm? You may a candidate for Botox or Juvederm if you wish to make your smile appear younger or brighter. Candidates for Botox are individuals who wish to eliminate facial wrinkles, correct a high lip line, or wish to relax their facial muscles for a younger look. Additionally, candidates for Botox must be between the ages of 18 and 65, and should be free from certain skin conditions around the proposed injection site. Candidates for Juvederm are individuals who wish to remove wrinkles, soften folds in their face, and add volume to their lips or other facial soft tissues. Additionally, candidates for Juvederm must be at least 18 years of age and should have no known allergies to hyaluronic acid or lidocaine. To find out if you are an ideal for Botox or Juvederm and which is best for your individual needs, schedule a consultation with Dr. Jerry Kronquist and Dr. Amanda Rae Kronquist of Sunset Dental Group today! What can I expect when undergoing Botox or Juvederm treatment at Sunset Dental Group? The first step in any Botox or Juvederm treatment is to discuss your treatment goals with Dr. Jerry and Dr. Amanda Rae Kronquist. Based on your treatment goals and individual facial structure, our dentists will explain their recommendations and anticipated results. Once you agree on a treatment plan, then your treatment will begin. To ensure a comfortable procedure, our dentists use both topical and local anesthetics. You will first be numbed topically, then a local anesthetic will be injected. Once you are numb, the Botox or Juvederm will be injected into the desired areas of your face. The entire process generally only takes a few minutes, but can last up to about thirty minutes. What can I expect after undergoing Botox or Juvederm treatment at Sunset Dental Group? After your Botox or Juvederm injections, you will not have to endure any recovery or downtime, and can immediately return to your usual activities. However, you may experience some minor swelling or bruising. If this is the case, it will usually decrease within a few days after the procedure. For the first three to four hours following your Botox or Juvederm treatment, you will want to remain upright and avoid applying any pressure to the injection sites. This is so that the injections will not settle unevenly. 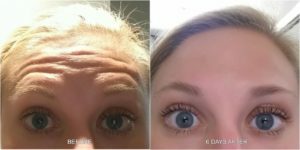 With Botox, it may take about three days to notice a difference, however the final results of Botox are not seen until about two weeks after treatment. For Juvederm, you may notice immediate results, however the final results still take about seven to ten days to appear. How long will the results of Botox or Juvederm last? The lifespan of your injections will depend upon their location and how your body responds to treatment. Generally speaking, however, Botox injections last about four months before needing follow-up injections and Juvederm fillers last about one to two years. What is the cost of Botox and Juvederm? The overall cost of Botox and Juvederm will depend on the area of the skin being treated, the number of injections needed to obtain the desired results, and how often you’ll need follow-up treatments. The initial cost of Botox is less expensive than Juvederm, however Botox requires more follow-up treatments than Juvederm. Botox is usually priced at an average of $13 per unit, however multiple units are required to get the desired results. To give you a better idea, generally upper lip lines require 4-8 units, while Marionette lines require 2-8 units. Thus, your total cost can vary. Juvederm tends to cost an average of $600 per injection, however its effects last longer than Botox. Are there any side effects associated with Botox or Juvederm? As with any type of medical treatment, there are always possible side effects. Although side effects from Botox are rare, they can include: bruising, swelling, numbness, weak muscles, headaches, pain at the injection site, and asymmetry. Hyaluronic acid is also safe for cosmetic use, but possible side effects from Juvederm can include: injection site pain, swelling, rash, tenderness, firmness, lumps or bumps, bruising, discoloration, and itching. To obtain your perfect smile with Botox & Juvederm services, schedule a consultation with Dr. Jerry Kronquist and Dr. Amanda Rae Kronquist of Sunset Dental Group today. Sunset Dental Group serves Santa Ana and other central Orange County communities.